In this demonstration, I am going to show you a couple of the same principles as the last watercolor demonstration, which are the wet-in-wet and wet-on-dry techniques of watercolor painting. Mastering these two basic techniques, you can create form and color variation, control the paint better, and achieve a whole lot more with watercolor. 1. Sketch: Start by lightly drawing out the sketch with a HB or lighter graphite pencil. 2. Coloring the center of the flower with yellow: Since yellow requires clean water, I start with the yellow color, and I paint the bottom of the center with a slightly darker yellow. Then, I let it dry completely before I do anything further to prevent run-off. The Cosmos petal has a kind of stripy texture on it, so I use the wet-in-wet technique first to indicate the light area , the shadow, and the texture of the petal. a. Take this petal for example, I wet the area with clean water. b. While it is wet, I apply the light pink on the petal and leave the light side of the petal not painted. c. While it is still wet, I apply the magenta to the end of the petal that is closest to the center of the flower. Paint one petal at a time, I wait for the petals to dry before I paint any petal to next to them. I have some petals done in the image to the right, and you can get the idea of what you can achieve from this wet-in-wet technique. It gives the petals a little texture and a nice soft pink tone. After I finish all the petals, I wait for them to completely dry. 4. 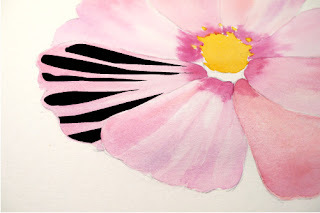 The second layer on the petals (wet-on-dry): After it’s completely dry, I apply a layer of light pinkish purple to exaggerate the texture of the petals a little bit more. Take this petal for example, I have highlighted the area that I applied the second layer of paint. When the second layer finished, you can see the flower has more depth now. 5. Detail touch up`: Use the wet-on-dry technique to finished the center of the flower and paint the cast shadow of the petals. For the center part of the flower, I apply dots of darker yellow to indicate the form. We are finished Finished! Painting in watercolor needs both patience and practice. You need the patience to let the paper completely to dry before you do the next step. Practice for the wet-in-wet technique, because it takes some time to figure it out. The more you do it, the more you will be able to use this technique and know what wet-in-wet can bring to your painting.